Smashing CSS: Professional Techniques for Modern Layout by Eric A. Meyer is from Sitepoint, 2011. This is a very different sort of book by Eric Meyer. Not in subject matter, of course, but in tone and purpose. Instead of his previous rather pedantic and encyclopedic listing of every thing you might ever want to know about CSS, this book is light, humorous, and organized to be read from front to back. If you've been paying attention to CSS for the last few years, most of this book will be old news to you. But the book isn't aimed for those already literate with CSS. It's meant to help the newbie learn enough to master the basics and go on to create some cool looks and layouts with CSS. Every chapter has lots of examples, screen shots, code, and advice. The first section starts right at the beginning with a chapter on Tools such as Firebug and SelectORacle. Chapter 2 talks about every kind of selector with advice about what works best when there is more than one way to accomplish something. The second section of the book deals with Essentials. In the chapter called Tips you learn about things like unitless line-height values, image replacement, and list styles. The chapter called Layouts reviews float containment and explains layouts like faux columns, liquid bleach, the one true layout, fluid grids, and the holy grail. In the Effects chapter he explains how to create an effect like his complex spiral. He also explains CSS pop-ups, menus, rounded corners, sprites, sliding doors, parallax, ragged floats, and constrained images. The final section of the book is Cutting Edge, in which he moves away from reviewing the foundation CSS knowledge of the past and jumps into new ideas. There's a chapter on Tables that shows new techniques for styling tables. He gives tips on using head, body and foot for table design and shows how to use a table to make a graph or provide data on a map. The final chapter is Cutting Edge. This chapter looks at HTML5, media queries, occasional children, occasional columns, RGBa, shadows, multiple backgrounds and transforms. 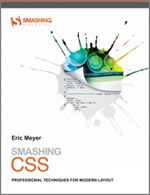 From a web education perspective, this would be an excellent book for teaching a CSS class. Summary: A perfect book for those just learning CSS.